This chapter on DC micromotors is intended as a tutorial review of the major engineering considerations required for the proper selection and application of ironless DC micromotors and tachometers. The text has been prepared for publication by Stock Drive Products with the permission of Portescap U.S. The International System of Units is used throughout this chapter, and Escap products are specified in this system of units. 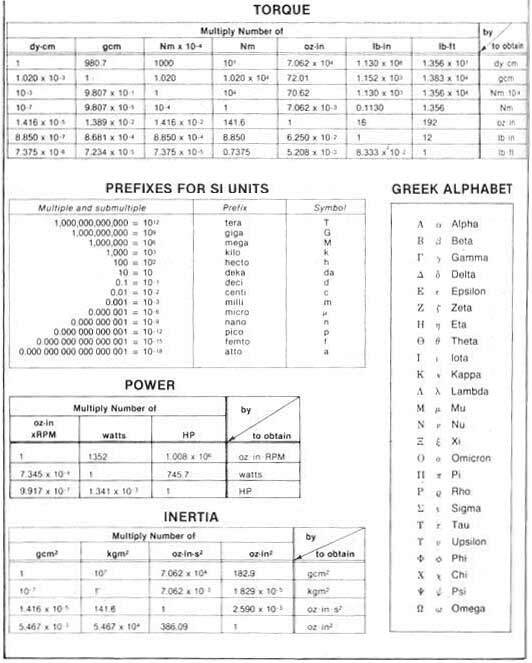 Consequently, the following tables have been prepared for the convenience the reader. A more complete treatment of the International System of Units and Conversion Factors is presented in the Designers Data Section of this handbook. Figure 1 shows the major subassembly breakdown of the motor. Brushes, housing, rotor and magnet are clearly shown. The primary feature is the self supporting "basket" construction of the rotor. In this geometry (Figure 2), the rotor is a perfectly wound (one conductor placed next to its neighbor without gap) surface of a right circular cylinder bonded to an insulating disc which supports the coil and commutator segments. The coil is wound in a unique skew configuration giving both electrical symmetry and mechanical stability. Precious- metal brushes and commutator are used to provide a near zero voltage drop, low friction and long life (Figure 3). Multiwire brush construction is employed to provide parallel contact redundancy. Finally (Figure 4) the motor is assembled around a central permanent magnet and core which supports the bearings, outer magnetic return path and also the brush holder. The stator consists of the central cylindrical permanent magnet, the core which supports the bearings, and the steel tube which completes the outer magnetic return path. All three of these parts are held together by the motor front plate, or the mounting plate. The magnetic core is magnetized diametrically after it has been mounted in the magnetic system. Owing to the low permeability of the permanent magnet, the magnetic resistance is great enough to allow neglect of the weakening of the stator field due to the rotor current. The ironless rotor, in the form of a cylinder, rotates around the magnetic core. 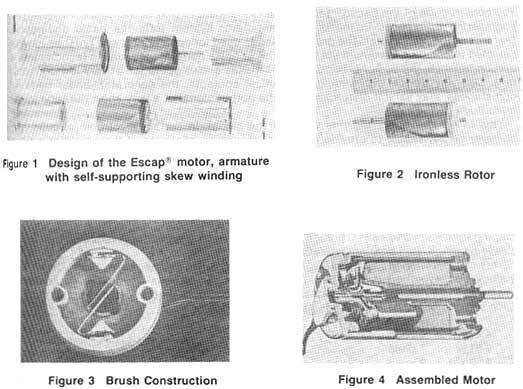 In Escape motors, the rotor is made in the form of a skew wound coil and is fixed to a disc carrying the commutator. According to the motor dimensions, the commutator has between 5 and 13 segments. The small commutator diameter results in low sliding-speed and the small friction gives high efficiency. The perfectly symmetrical construction of the skew wound coil makes for smooth and silent running. The crossing of the wires makes the self supporting rotor winding (armature) highly stable mechanically. The endcap includes the brush system. Owing to the use of precious metals for the brushes and the commutator segments, the low contact resistance of the brushes is maintained throughout the life of the micromotor and ensures starting at very low voltages. 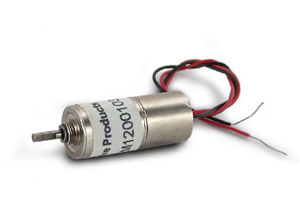 The construction of the Escap® tachometer is identical to that of the motor. However, some engineering differences in the brush commutator system form the basic distinguishing features of the tachometer. The precious metals used for commutator and brushes have been selected to combine maximum life time with low noise performance. Unlike tachometers with carbon brushes, the use of precious metal brushes allows operation at very low currents (1 mA). Like any device with sliding mechanical contacts, the generator, under certain cir cumstances, may exhibit disturbances in the output signal of a very short duration (order of magnitude of 1 mS). This in no way alters the rms value of the signal. in certain electronic circuits it may however be adviseable to provide a high resistance parallel path at the amplifier input or a simple filter circuit. The choice of the generator will essentially depend upon: Electronic considerations, such as desired value of signal and tolerated ripple, mechanical considerations, such as stresses on the shaft or resonance phenomena between generator and drive system. We would add that the cleanliness of the signal depends to a large extent on the precise alignment of motor shaft and driven shaft, and that under severe conditions shielding of the tacho leads may be useful. The standard models are designed for operation at temperatures ranging from -30° C to +65° C (-20° F to +150° F); higher temperatures reducing the life of the sleeve bearings. Ball bearings are also available. The actual value is largely determined by the precision of manufacture, primarily in coil winding.